Today Caroline Rush CBE, Chief Executive British Fashion Council, Margot James, Minister of State for the Department for Digital, Culture, Media and Sport and Stephanie Phair, Chairman British Fashion Council welcomed key figures including media, retailers, BFC patrons and partners to the opening of London Fashion Week September 2018. Welcome to London Fashion Week! Thank you all for joining us bright and early on this Friday morning. It’s the start of a really incredible five days ahead. A summary of the line up; we’ve got Margot James, who is our new Minister for Fashion.. and also digital and the creative industries. Stephanie Phair who is our new Chairman – this is her first womenswear season in her new role, you have not heard from her yet, but you are about to. Since June we have been focusing our plans for the years ahead, but while planning for the future is exciting so is celebrating the now, particularly when it comes to LFW. 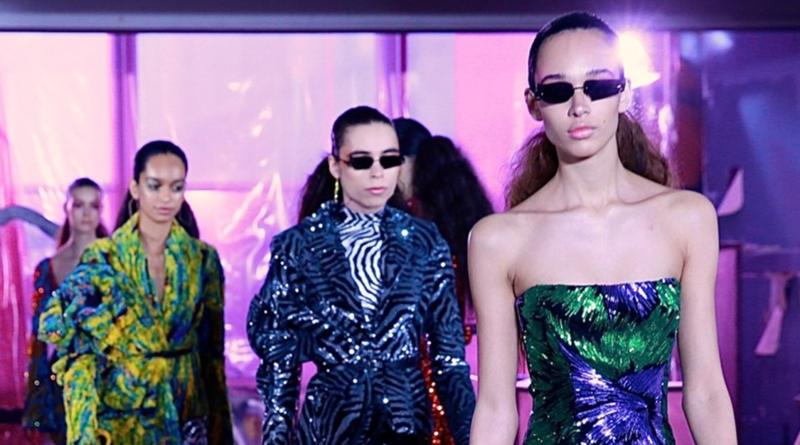 There is no better city in the world for fashion and no better place to see the breadth of British and global fashion talent than here, at London Fashion Week. We have new data – we are worth £32 billion in GDP to the British economy, that’s 5.4% growth against the economy’s 1.7%, representing 890,000 jobs, again an increase of 1.8%, again outstripping national growth figures – so some really good news stories for our industry. But of course people come to London to see our breadth of talent, and whilst there will be a lot of excitement around Burberry, Victoria Beckham, Jenny Packham and Alexa Chung as well as a season of anniversary celebrations, our international audience are here to see all of our brilliant designers. We know that everyone will be on the lookout for the hot and the new and there is no better place to look than our NEWGEN designers; you will see them on schedule and in the exhibition right here at 180 Strand at the Store X; there are two floors of Designers Showrooms, so please go round and see the incredible collections and meet the designers. You have to watch out for our Fashion Trust designers and of course Molly Goddard who is this year’s BFC/Vogue Designer Fashion Fund winner, selected by industry insiders, so you know they are worth taking a look at. Think about Positive Fashion, think about positive change, you will have seen that this is the first time the designers showing on schedule and in our showrooms have selected to be fur free, it’s an incredibly exciting moment and is something we’ve been monitoring for the last few years. This time in February model Adwoa Aboah our ambassador for diversity, called out to London to be the global capital for diversity on the catwalks, so let’s hope we are going to see that this season. Of course we’ve had incredible coverage supporting diversity and sustainability over the last few issues; of Vogue, Elle, Porter Magazine and Harper’s Bazaar, so thank you all for your incredible support. We wouldn’t be able to talk about London Fashion Week without our sponsors, so a big thank you to all of them, particularly VIP.com who are our first Chinese Ecommerce partner - some of you would have had the opportunity to come to the VIP.com show yesterday featuring four designers, live streamed directly back through their site to China and by 7 o’clock last night we had already reached 3 Million customers. It’s incredibly exciting for us to make this bridge between the UK and China. Thank you to Mercedes, thank you to Nivea, thank you to Gold Collagen and of course to the Store X, who are hosting us over the next five days. To all of our guests and everybody that is arriving from New York, to all of our international guests that are coming to London to support our talent, thank you for being here. British fashion is a really special community with a network of support and we really appreciate everything all of you do. Enjoy this week, it’s going to be epic! A final thank you, is of course to my team, they work incredibly hard – thank you British Fashion Council for all of your hard work, you absolutely rock! Have an incredible London Fashion Week and let me pass you on to our Minister for Fashion, Margot James. I am delighted to be here, at my first London Fashion Week since becoming Minister for the Creative Industries. Fashion is very important to me personally but also to the Government and to the Prime Minister. I want to thank Caroline and everyone here at the British Fashion Council, for ensuring London Fashion Week is once again at the heart and centre of the international fashion calendar. UK fashion is an industry admired by the world and I am very proud to be associated with it. The UK is a global fashion capital and home to world-renowned brands such as Alexander McQueen, Erdem and Sophia Webster as well as up and coming labels like Alexa Chung and Matty Bovan. The wool trade once accounted for over 80% of our exports and powered the industrial revolution. Now the UK's fashion industry is worth over £32 billion and has created 890,000 jobs and is powering the government's new industrial strategy. That’s nearly a million people buying, selling, marketing. British businesses depend on the creativity, talent and sheer hardwork of this iconic industry. Government is committed to giving creative firms across the country the support they need to compete on the global stage. To help these businesses fulfil this ambition we recently announced over £4m for the new Creative Industries Trade Board, which funds fantastic projects like the British Fashion Council’s LONDON show ROOMS in Paris. As well as trade, the British Fashion Council also does incredible work to nurture, support and grow both domestic and international talent, so important to this global industry. I’m delighted to be wearing Mother of Pearl today, one of the designers supported by the BFC, who also gives a lot back to the industry herself as I’m being told today. Our innovative designers and fashion houses showcase the nation's creative zeal, which is why Government is determined to do all we can to support this hugely successful sector and are working with the BFC to ensure access to international talent through our new exceptional talent visa. I’d like to thank the many people working behind the scenes without whom such events would not be possible. London fashion week has been going for 35 years and remains as important and trend-setting as ever. And I know that this will be the case for many years in the future. I will now hand over to Stephanie Phair, the brilliant new Chair of the BFC. Good morning. Welcome to London Fashion Week. This is my first official London Fashion Week as Chair of the British Fashion Council and I can’t wait to see the talent that I know London has, showcase their collections to the global audience we will be hosting here over the next few days. The story I am keen to tell this fashion week, is that behind the creativity we will see on the catwalks, there are strong business stories, that London is THE global fashion capital and that the businesses here and talent that studies here fuels creativity and innovation around the world. Since the announcement of my appointment back in May I have been in listening mode, I’ve met with a great many stakeholders and look forward to meeting many more over the next few days. What I have learnt is that there is great pride in our industry, our businesses, our talents and that there is a willingness to collaborate to support more talent, open more doors and see more growth. Harnessing the collective power of the industry to enable that growth is the mission of the BFC quite simply. When I agreed to take on this role, I knew that as an industry we are facing extraordinary challenges, much brought on by the disruption in digital. I know that my background in digital will play a role in helping us shape some ambitious plans for change, putting digital innovation front and centre. I really believe that in times of change that there are the most opportunities, and my experience has taught me that success comes from embracing and harnessing change, not running away from it. With this in mind, Caroline, the British Fashion Council Board and I are re-shaping our focus for the future. I must add, the organisation is in great shape and I would like to thank Natalie Massenet for her energy and enthusiasm for leading the board so successfully over the last five years. The BFC has a great team in place, making us confident that we can put in place ambitious plans, embrace new thinking and prepare ourselves for a challenging and exciting future. Like Natalie did before me, I’d like to use the opportunity of Fashion Weeks to put a focus on our strategic pillars: Business, Reputation and Education and champion the work that has been done and put the ask out for more to join and drive progress. This season I’d like to start with our Business Pillar and with that the brilliant businesses that are part of Fashion Week. I have met quite a few designer businesses already and have heard first hand some of the challenges they are facing, but these aren’t unsurmountable and the drive, creativity and passion that I have seen has given me every confidence we are in great shape of the future. The re-vamped business pillar will offer a programme for more businesses and their teams to access support, expertise and information needed to grow their businesses. Digital will play a key part, no longer a pillar for the organisation on its own, instead as part of this new way of thinking, we now consider it a transversal muscle flexed in everything we do; to do this Google have offered dedicated leads on all pillars to challenge and support us on our initiatives. We are appointing high level mentors, to help inspire designers, create a team on mentors in their area of expertise and create toolkits relevant for designer businesses. We will bring together CEOs from broader businesses to identify challenges, share knowledge to overcome these and set high standards for businesses to operate through our Positive Fashion stream of work. As we approach Brexit, never has this been more important, and creating a constructive dialogue with Government to ensure our businesses are prepared and to argue the case where damage could be done is something the British Fashion Council already does every day. I would like to thank all Pillar Presidents Sophia Neophitou, Sarah Mower & Meribeth Parker and as we champion our business pillar are very special thanks to Sian Westerman who has agreed to stay on as Business Pillar President and work with the team on executing these strategies. But strategies and metrics go hand in hand and we are now looking at how beyond the big figures we have shared today, we can track the specific work of the organisation, measure ourselves against some ambitious targets and demonstrate even more to the industry how intervention, support and access can deliver to British businesses. And as public funding services deplete, we will urgently look at how we can fund and sustain through the private sector the support we provide to all of you – whether new designers, established brands with a 10-year track record or our large global businesses that also need voicing on their behalf. Beyond fashion week we want to open our doors to a broader range of businesses that could access our support and we want to wrap our arms around a more diverse range of players who should also be recognised as part of the British fashion community. But you you’ll hear more of that later and see it in practice over the next few years. Speaking of funding, how do we ensure that there is a strong investment ecosystem in the UK that can invest intelligently in business, not just at early stage but throughout the business lifecycle, especially at pivotal times such as entering global markets. Sian will help us navigate this complex landscape to the benefit of all. This week we should rally the support of industry, consumers, the city, the creative industries to champion fashion businesses, after all fashion is the ultimate cultural signifier. Beyond music, art, fashion is the most visible express of self. Fashion empowers us, it defines a sense of self and no place more than London celebration difference while bringing people together. And in time of politic division, when border seem to be closing, it is important that we celebrate what can unite. I would like to thank our sponsors and patrons, you are our partners in shaping the future and we look forward to finding new ways to add mutual value to our businesses. I encourage more of you to join us on our mission. I believe that together we have huge power to transform and industry and the lives of our community. This power will not only grow the sector, but it will carefully, strategically and globally nurture talent for the years ahead and that is a win-win for us all. Take every moment to celebrate the talent you see over the next few days, don’t be shy on social, in print and sharing what you have seen with the fashion community and directly to consumers. I look forward to working with you all and sharing our progress with you over the coming years.